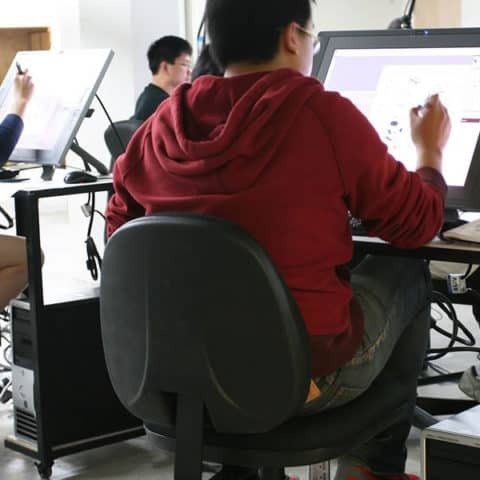 The Academy’s facilities are designed to prepare you for the visual development career of your choice. Our hands-on learning environment creates a culture that supports curiosity, investigation, and production. Online students are also hands-on, as they engage in discussions and activities through the online platform, social media, and real-time streaming of our events. Both online and onsite creative arts studio environments are equipped to give you the skills you need to create the visual development career of your dreams. Work on real animation light tables and discover traditional techniques for injecting life into your stories. Wacom Cintiq tablets are available for both in-classroom and lab-based projects and allow students to draw effortlessly in a digital format.